Eddie O'Donnell was a works Duesenberg driver who raced at Indy on three occasions with a best finish of 5th in 1915. He was killed in a crash in 1920 that also took the life of Gaston Chevrolet and Lyall Jolls, Eddie's riding mechanic. Eddie O'Donnell was born in Faribault, Minnesota. Eddie raced and also acted as a riding mechanic for Eddie Rickenbacker in 1914. On the 28th July, in a 300-mile race at Galveston, Texas, one of the tires blew out on Rickenbacker's Mason (which soon became a Duesenberg) at 90 mph. Instead of coming off the rim, it got caught and flapped repeatedly across Rickenbacker's left arm and shoulder. Just before he pulled of to retire thus avoiding a fractured arm, it stopped. 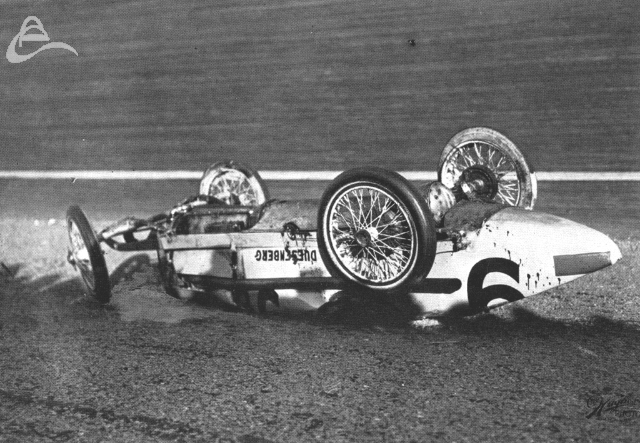 O'Donnell had got between the flappiong tyre and Rickenbacker's body and was taking all the punishment. By the time they got back to the pits to change the wheel both men had severly lacerated arms and torsos and O'Donnell had a separated shoulder. He first drove in AAA that year and made an impression right away. Driving a Duesenberg on the dirt oval at Kalamazoo he finished second on his debut. A month later he was fourth at Galesburg, again on a dirt oval, and third at St. Paul the following week. In Novenber he took part in the Corona road races held on the three mile long, 70ft wide circular main street called the Grand Boulevard that ran around the city center, finishing third again. He took his first win the following year in February when he won the 100.7 mile AAA race on a 1.9 mile city street course in Glendale. O'Donnell averaged 47.6 mph. He followed that up with another win four days later on the Ascot Park dirt oval. After a poor showing in San Francisco where he pulled out of one race due to dad weather and crashed out in the next, he qualified for the Indy 500 in 11th spot, finishing 5th and winning $3,000. He took 8 more podium finishes that year including a win at Galesburg. He only raced sparingly in 1916, but did win the Corona road race at an average speed of 85 miles per hour with Jimmy Murphy as his riding mechanic. It was the last time races were held there due in part to the tragic accident which took the life of Bob Burman his mechanic and a spectator. In addition, the cost and local effort needed to stage the event was difficult for a town the size of Corona. America's entry into the First World War intervened but he was back at Indy in 1919 but after a fine effort in qualifying which saw him line up in 5th place he went out on lap 60 with engine problems. He didn't win any races but did finish second on the board track at Uniontown. In 1920, still racing Duesenbergs, he made the start at Indy in 12th but went out again with a broken oil line after 149 laps. His season went reasonably well with a number of top five placings and a second on the board track at Fresno in October. Then on the 25th of November he had qualified 7th on the Los Angeles Motor Speedway board oval at Beverly Hills for the Beverly Hills 250-Mile Race. In the race Gaston Chevrolet was leading when he crashed on lap 146. Chevrolet's and O'Donnell's cars became entangled and Chevrolet and O'Donnell's riding mechanic, Lyall Jolls, died at the track. Eddie O'Donnell died the next day at the California Hospital from his injuries.